Hello sunny fabulous Tuesday. 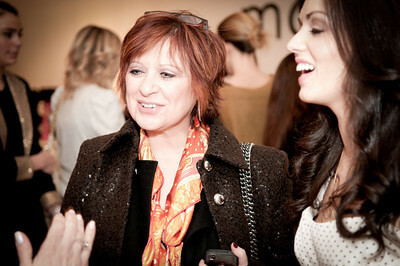 Where were you last Wednesday for Accessorize for the Home hosted by me at Modami Furniture in NYC? It didn’t matter, because neither sleet, nor hail, nor snow could keep my favorite domestic divas and divos from coming out for the cozy soiree. For those who didn’t follow the tweets from @TeamPamPekerman, at Accessorize for the Home I showcased my top 10 home accessories to a divine group of 35 media darlings and TV personalities, including the lovely Caroline Manzo of Real Housewives of NJ (aka Bravo’s favorite mom), Good Morning America, The Today Show, style expert Jenn Falik, on-air style expert Jess Zaino, YourBellaLife.com, SheFinds.com, FashionIndie.com, SecondCityStyle.com, Martha Stewart Living, Good Housekeeping, NY Post, OK! Magazine and HollywoodLife.com. Guests noshed on yummy treats courtesy of Glow Gluten Free and The Cake Designer, while sipping on a custom blend of Given Liqueur (not your grandpa’s tequila!) and tea. The blending was flawlessly performed by Jennie and her team at Teologie. Peony Pamela was a light hibiscus mix that was the evening’s favorite. Wanna know more about this drink and what the teologists can do for your next soiree? Follow @TeologieNYC on Twitter. With liquor in their hands and cookies in their bellies, guests were then treated to complimentary hair styling courtesy of Maria Bonita Spa & Salon, as well as hair analysis from Bio Supplements. You know t Brazilians know that it takes to be hot, so why not try Bio Supplements, an exciting new brad from Brazilian that will give you the at home hair styling products your specific hair type needs to look it’s Brazilian best! Oh, and of course then there was my Jewish Oprah time. 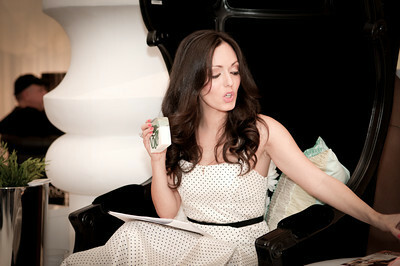 while hosting Accessorize for the Home. Accessorizing your body, bedroom & beyond. Sure spring is in the air, but we’re not out of the windy woods yet. Wouldn’t you love to close out the season with a stylist pair of boots? Thought so! 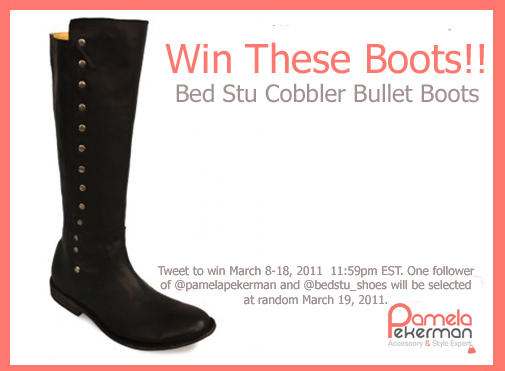 One lucky reader will be stepping out in style with Bed|Stu’s Cobbler Bullet Boots. Handcrafted in Mexico with the finest full grain leather, this is the boot you’ll keep turning back to year after year. I liken it to that cozy sweater you always wear at home, even when you buy new loungewear every year. Bed|Stu footwear molds to the bed of your foot, so you can say “goodbye” to uncomfortable arches and insoles. I love Miami. I love religious jewelry. I love (ok I’m obsessed with) Café Bustelo. All three collided last week for a perfect trifecta of sunshine, sparkle and coco, when I met the ethereal and lovely Natalie Pomeranc of the newly launched (we’re talking about a week old) Jewelry by Natalie, at Café Bustelo on Collins Avenue in Miami. Jewelry by Natalie is an uplifting costume jewelry brand with prices that can’t be beat. Everything is under $50 and as delicate and flawless as the adorable designer behind the brand. 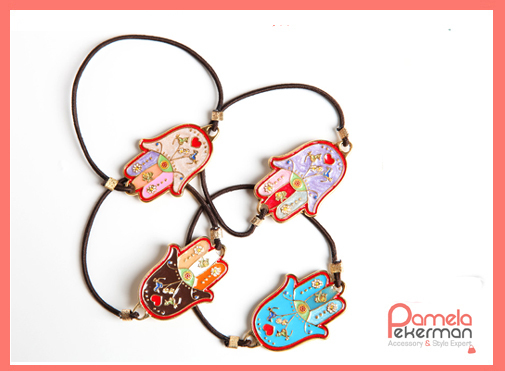 My eyes locked on an Enamel Hamsa bracelet. Each vibrant color on this piece is carefully painted in, then fired, and the process goes on until every minuscule nook is beaming with vibrancy. All that work and the piece is only $28. Below you’ll also see a Gold Coral Cuff ($48) that channels wonder woman and a Filigree Hamsa Necklace ($36). All prices include continental US shipping. I know the Hamsa as a Jewish symbol of protection. It has been used to represent the five books of the Torah and the five senses to praise G-d. Hamsa also has Arabic roots where it is called the hand of Fatima, commemorating Fatima Zahra, the daughter of the Prophet Muhammad. Both cultures see it as a symbol to ward off evil. We may as well ward off bad vibes in style. I love to stack two or three on my wrist for extra protection.